Photo booth hire Edinburgh, Midlothian, East Lothian and West Lothian. Are you looking to hire a photo booth? Platinum Discos provides something quite unique in that we are the only company that gives you 6 by 9 inch prints rather than the tiny 6 by 4 inch prints that everyone else offers. This means our prints are two and a half times bigger! At a recent wedding where we provided the photo booth we had lots of girls who were getting married asking for a card as they were so impressed by the size and quality of our prints. Our photo booth also can send your photos to Instagram, Facebook or by email as well as being printed. This is very good if you want your photos to go on line instantly. This obviously depends on us having an internet connection at the venue. Photo pod inside our photo booth. We also give you a copy of all your photos in a 100 page photo album. It’s a very nice quality and has a space for your guests to write you a message next to the photo. Copies of all your photos can also be added to a flash pen so you can take them home digitally. We also supply photo frames with either a black, silver or gold surround. They look amazing and you also get a bag to keep your photos nice and clean. The one thing we’ve noticed is that people look after their photos and take them home. With the tiny 6×4 prints most of them get left and end up in the bin. We also supply two prop boxes with hats, glasses, wigs, jewellery, moustaches, inflatable guitars, microphones etc. The props make for some really funny photographs. 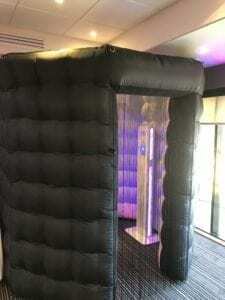 Our inflatable photo booth is quite unique and has an 8ft diameter and is 8ft tall. It’s quick and easy to set up and the photo pod inside is classy and has led lights along its edges. The photo booth also has led lights built into the base. Other options include a white backdrop for larger group photos. 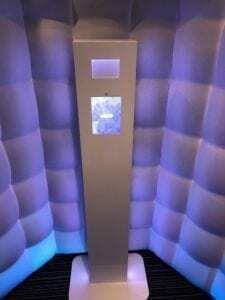 Hiring a photo booth is very easy to arrange and we offer two, three and four hour hires as standard. Longer bookings can be arranged. 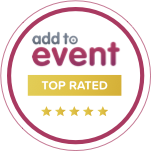 We hope I’ve explained all the benefits of my photo booth and that you’ll want to hire my photo booth for your party. Photo booth hire in Perth, Dundee and Angus. 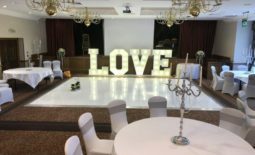 Led dance floor hire and photo booth hire Inverness.